Pairing curtains and blinds is the second thing after the paint that can give a new look to the room. However, it takes some aesthetic understanding to choose the right curtains and install them. They not only deck the space but also offer you privacy when needed or block the sun to protect your valuables in the room. It also softens the space and uplifts the structure. Shopping online has made the task a slightly easier. But, there is a way to go about it. What are your reasons for getting the blinds or the curtains in the first place? When you realize the purpose, it makes the task of choosing the blinds slightly easier. Try to understand how long or wide you want the curtains and blinds to be. Certain patterns come with a flow only when they are of specific measurements. You might have to sit with space for some time and take a close look at it, as they have the potential to make the room appear tall, wide, huge or small. The entire frame, design and installation depend on the measurements. There is a specific way of measuring the windows for curtains, blinds. Even the slightest error can ruin the look or make the installation process next to impossible. Who will want a curtain that is too long or slightly short and kills the entire look? Hence, you need to call in the experts to get the size of the windows for the curtains and blinds. While it is obvious that people pay a lot of efforts in looking out for the right material for their curtains and blinds, they tend to overlook the hardware. It is necessary that you focus on the rods as well as the hooks that will hold the curtains. There is a variety of hooks and rods that you have to pick from. Hence, while you are extra careful with the fabric, color, and the length, you also need to choose the hardware accordingly. They should blend well to bring out the right effect. Also, make sure it is sturdy enough to bear the weight. You will not want the entire thing to collapse in the middle of a meeting or an event. 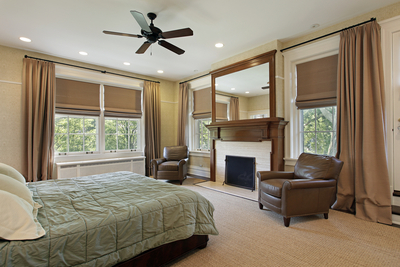 Just like there are patterns in curtains and blinds, there are numerous ways of hanging them. For instance, if your window is too short, the blinds or curtains should be mounted above the frame. It creates the perfect illusion that the window is tall. Similarly, wider frames create a wider appearance for the window. The aim is to get the right look for the room. This will involve a lot of planning and hence, you will need an expert opinion. There are ample ways to spice up the look of the blinds and curtains. In fact, you will find some for casual settings and other for the formal ones. For instance, you will come across tiebacks that you can match with the rods and the hooks. Right from the regular fabric to the fancy ones with the tassels, you will get ample alternatives to choose from. You simply need to decide if you want something simple or elaborate that will go well with your current setting. These tricks will set you on the right track of sorting the right blinds or curtains for your space.